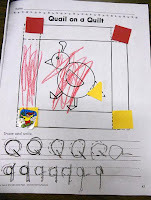 Pre-K is still working on their alphabet books. 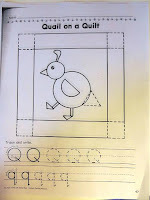 For the month of January they added the letters Q, G, and S.
For Q the children's page for their books was a Quail with a Quilt. 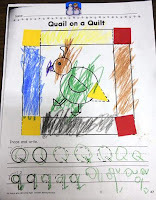 The craft picture was also a quilt--Q is hard. I had cut out some fabric into squares. 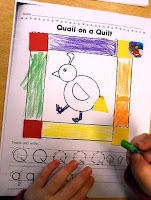 I drew a large square on the paper and had them glue 4 pieces of fabric to make a quilt. 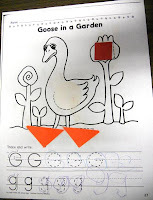 Our G page was a Goose in a garden. 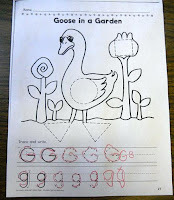 I have no idea why, but this goose has got to be the saddest goose ever. 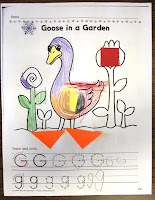 I thought it might be nice to incorporate our senses unit into the craft picture. So since we had talked about sight, we made glasses. I had cut some circles, then cut out the insides. The children glued to circles down and glued googly eyes inside. The added the center and sides with a marker. I thought they were pretty cute if I do say so myself. 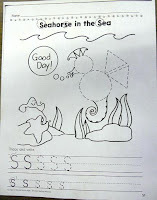 The letter S gave us a Seahorse in the sea. Since S was on beach day we made a starfish, or a sea star depending on your preference. 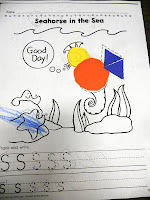 I had put the work sea star on the picture because it had two S's in it. To make the sea star, I had cut out the shape. The children painted some glue on the sea star and sprinkled it with glitter.